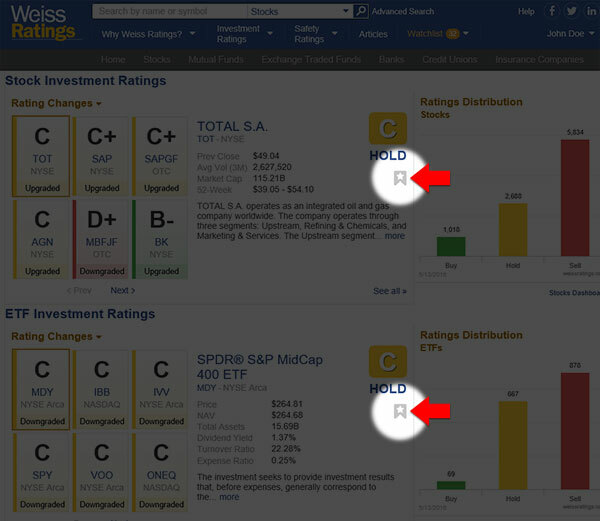 One of the most useful tools available to you in Weiss Ratings is your Watchlist. 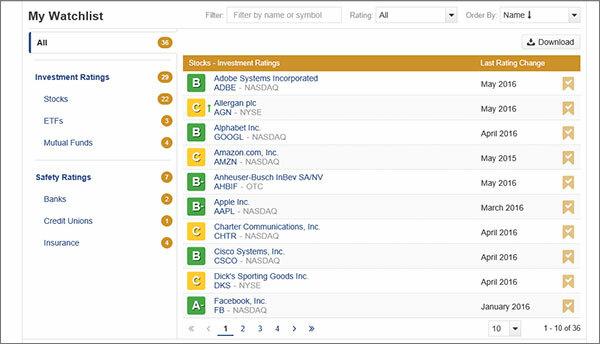 Creating a Watchlist allows you to see—at a glance, and all in one place—a list of all of the companies you want to keep an eye on. And it doesn’t matter if they are Investment Ratings or Safety Ratings, you can access them almost instantly. Think of it as a dynamic bookmark list you can add to and change at any time. FIRST: You’ll notice on all of our pages, right near our Rating, there is a small flag with a star in it. ADDING: All you need to do is click that flag, and the star will change to a check mark. That’s it. The company has been automatically added to your Watchlist. 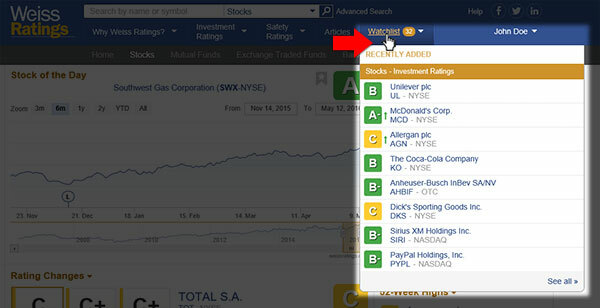 REMOVING: To remove the company from your Watchlist, simply click the flag again, and the checkmark changes back to a star. VIEWING: And you can access your Watchlist no matter where you are in the site. It’s always available from the top navigation bar. Hover over the word Watchlist and your list will drop down so you can see your listings and their ratings at a glance. Click the word Watchlist, and you’ll be taken to your Watchlist page. Here you can see the total number of each Investment and Safety Ratings you have, remove listings, or click to be taken to the company’s summary page. And you can choose how many results you see on the page. In the bottom right corner of your Watchlist, you’ll see a dropdown menu with the number 10 in it, just to the left of the total number of Watchlist entries. Click the down arrow to select how many entries you’d like to see per page. You have the option to choose 10, 25, 50, or 100 companies per page. Or you can choose to have all of your watched companies to appear on a single long page. You also have the ability to download your Watchlist. All you need to do is click the Download button in the upper right corner of your page, and a PDF of your Watchlist will be instantly generated, ready for you to save or print. The best thing about your Watchlist? If there is any change in the rating of any of your companies, we’ll send you an email alert--so you can rest easy knowing we’ve got your back. And remember, you can add as many companies to your Watchlist as you like-- there’s no limit, so enjoy!